After being missing for five days John Carson Bryant was finally located. Lt. Jay Baker said Bryant was found in a local Hardee’s restaurant eating lunch. Bryant told authorities that after a family dispute on Thursday he decided he was "going to drive to the West Coast". It appears that Bryant made it to Louisiana (from Georgia), and then decided to turn around and drive back home. It appears that Bryant is safe and sound. John Carson Bryant, who has Alzheimer’s Disease, disappeared on Thursday and is still missing. It appears that Mr. Bryant withdrew more than $1,000 from the bank right before he disappeared. John was last seen in Acworth, Georgia (Cobb County). Mr. Bryant, who is white, stands about six feet tall and weighs 215 pounds. He has gray hair and blue eyes and was last seen wearing shorts and t-shirt. 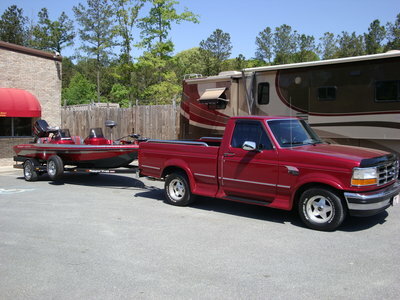 Bryant is believed to be driving his truck, a 1994 red Ford F-150 with Georgia license plate DP1V11. Here is a picture of his truck.